Every coin collector or dealer is certainly aware that when it comes to shipping any part of their collection or inventory, it can, at times, be a tricky or even risky enterprise. This is partly due to the fact that the most common package transport companies, like United Parcel Service or the US Postal Service for instance, have clauses in their service agreements that permit them to automatically reject any insurance claim for ‘misplaced’ packages containing coins. Their rationale for this is based on the assertion that the contents are of ‘unusual value’, or that they are prohibited from allowing them to be shipped in the first place. One the one hand, if the coins are packed in a proper and secure fashion there will likely be few issues to be concerned about, and the shipment will arrive at its destination without a hitch. However, if the particular carrier of choice winds up losing the package, or someone working within the carrier’s network happens to get their hands on the package with less-than-legal intentions, then that package is basically history, and both the shipper and recipient are certainly out of luck. To keep this possibility to an absolute minimum, there are a few helpful ideas to consider in avoiding this type of unfortunate and costly situation. The first order of business is to always make use of the all-important tracking number. If a package is shipped, and is subsequently lost, the fault will obviously be somewhere down the line. Nonetheless, being in possession of the tracking number as the verifiable proof of the shipment assures that any follow-up procedures and claims can be initiated, and the transaction will not be a total loss. It is also very prudent to make certain that those who are to receive the merchandise are advised of not only the shipment’s status, but that the transaction’s conditions are based on it being undertaken at the recipient’s own risk, especially where compensation or payment is concerned. Once the package is on its way, there are obviously circumstances that are well beyond anyone’s control no matter what precautions are taken. Needless to say, if the package is given over to a carrier without a tracking number, the entire process becomes a gamble, and any claims filed for any subsequent monetary loss, even if the buyer received the package, becomes subject to question. Without having the verifiable proof of the package being sent, tracked, and received, anyone can be taken advantage of not by only the delivery service, but also by any buyer on the other end who might turn out to be less-than-honest. If the U.S. Postal Service is the carrier of choice, the best method for any valuable shipment is to make use of the Registered Mail option, which requires the person receiving the shipment to sign off on the package being properly delivered and accepted. When it comes to shipping valuable coins, it is a wise policy that any merchandise over a specific dollar amount is sent via Registered mail, and most importantly, at the buyer’s expense. If a serious buyer is willing to pay a substantial sum of money for any valuable coins, paying an additional fee for Registered Mail to assure their coins arrive safely should not be an unreasonable request. Packing any amount of coins in the safest and most secure manner is an absolute necessity. When it comes to shipping something as valuable as coins, no expense should be spared. This important precaution will significantly reduce or eliminate the chances of any damage should the package undergo any rough handling during the numerous transit points along the way to its destination. The idea is to prevent the package from opening and the coins coming loose or spilling free. In addition, it is also extremely important to ensure that the coins do not make any noise inside the package. If coin tubes are used, they need to be wrapped or enclosed with materials capable of deadening any sound produced to reveal the presence of ‘coins’. It is vital to remember that the sound of coins inside a package would surely generate a tempting idea to anyone who happens to hear it, and any dishonest person in proximity of the package may choose to make off with its contents. If padded mailers are used, another good idea is to double-package them with a good supply of strong packaging tape on the outside. The objective is to eliminate any possibility of damage to the package occurring during transit, which removes any liability due to the carelessness of the person shipping the coins, so make sure the coins are packed with the utmost attention to detail. Every collector also knows that buying, selling and trading is one of the principal pleasures of coin collecting. While these transactions often involve some form of overland or overseas transport, the most important thing is to keep the coins safe and secure during shipment by using the right coin shipping supplies, such as coin envelopes and coin holders to keep coins in place during shipment to avoid unnecessary abrasion. From there, the envelopes or holders can be shipped with confidence by sliding them into bubble mailer envelopes to allow them to ‘float’ on a cushion of air until arrival at their destination. One of the most secure methods for coin shipments are either Safe-T mailers, the Air-Tite Sure-Safe Shipping Tubes, or the Kraft bubble mailers. After deciding on the method, finish off the package with a strong packaging tape that helps to create a water-resistant seal, while adding a final layer of security and protection between the coins and the hazards and rough handling during transport. The Hefty Express brand Air-Kraft Bubble Mailers are the made of the highest quality materials, while being the lowest weight available, which will cut down on the expense for shipping coins. They are made with a Self-Seal design, which means that no added tape is required, and are made with a seamless bottom enclosure for optimum strength with a 3/16″ bubble lining. These are available in four convenient sizes – 4″x8″, 6″x10″, 7″x12″, and 9″x14″. Safe-T-Mailers are the perfect method for shipping coins or coin slabs, and have been used by thousands of collectors and dealers for more than 25 years. 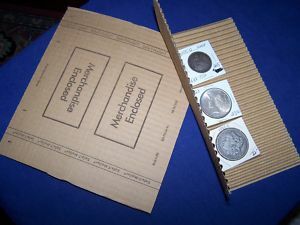 Because of their uniquely convenient design, packing coins for shipment is effortless, using the two corrugated flaps of the Safe-T-Mailer, combined with a special, self-adhering adhesive that allows them stick to each other, but not to the coins enclosed inside. There is no awkward taping, peeling or stapling. The secured coins can then be inserted into regular or business-sized envelopes or bubble mailers. The Air-Tite Sure-Safe shipping tube allows any collector to safely ship coins when buying, selling, or trading any part of their collection or inventory. Coins contained in the tube are kept apart by uniquely molded comb-type separators, and locks shut with the use of black plastic rings fastened over each end of the tube. These tubes hold up to 20 coins between 38mm and 40.6mm sizes, and are ideal for securely shipping Morgan, Peace and Eisenhower Dollars, 1 oz. Silver Rounds, Silver Eagles, or even 1 ounce silver bars. This is by far the most convenient and easiest-to-use tape dispenser available on the market, and specifically designed to be used with 2” carton sealing tape. It is manufactured with high-impact plastic, along with a heat-treated steel blade. It is a great deal easier to use and far less expensive than the standard pistol-grip style tape dispensers.